The Wildlife and Countryside Act (1981) established a nesting bird season, and made it illegal to intentionally injure or kill any protected species. Anyone caught doing so could face thousands of pounds in fines or even a jail sentence. In the UK, the protected birds list includes seagulls, so if you do have a problem with them, the last thing you ought to do is take matters into your own hands. Seagulls conjure up images of seaside holidays in bygone days, but they are increasingly found in urban areas. This is due to the abundance of food thrown out and stored within easy reach. Rooftops make a perfect perch for gulls, and the reliable food source gives them enough reason to stay and nest. What threat can Seagulls pose? Seagulls may seem pretty harmless on the face of it, but they have no aversion for human activity – they often land on cars, street furniture and even people to get their food. 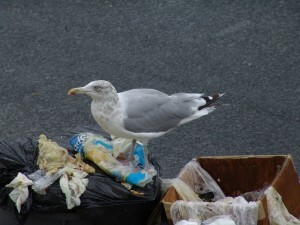 Apart from littering their surroundings with their droppings, nesting seagulls can also be pretty vicious. If they believe their chicks are in danger they will do anything to protect them. This makes them a serious pest for any business to contend with. When there is a need to carry out building maintenance (e.g. cleaning air conditioning units, making roof repairs) nesting seagulls can pose a threat to the health and safety of contractors and/or staff. As well as potential injuries due to seagull attacks, there is the added risk of falls whilst working at height. These dangers could have serious implications for your business, so you will want to do your best to eliminate the risk. To make sure your business doesn’t become compromised by seagulls, there are simple things you can do like removing potential food sources. 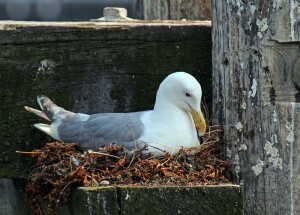 However seagulls often attempt to nest and breed in the same place each year. This means if you’ve had a seagull problem in the past, you may continue to have the same problem regardless. Over time, there could be even more young and an increase in population each year, unless something is done about it. Bird Netting – Netting comes in all shapes and sizes, and can be customized to any building type. This will prevent birds from accessing sheltered parts of the building where they will be more inclined to nest. Bird Spikes – These reduce the amount of outside space available for birds to land on. Spikes can easily be attached to buildings with a strong, natural adhesive, and come in various sizes. Single rows of spikes are fine for small areas, whereas multi-row spikes can cover larger areas. At Europest, we always recommend preventing seagulls from becoming a pest in the first place by careful use of bird proofing. However if the problem is too far gone, we also have a professional licence to deal with problem birds, and can remove bird nests safely if the action can be legally justified. So instead of taking the risk of taking matters into your own hands, why not call in the professionals? To get a free personalised quotation for seagull deterrents or seagull nest removal from Europest, fill out our enquiry form above, call us on 0800 587 0506, or send us an email. Don’t wait until it’s too late!